The Avalanche features several moving parts and removable parts, and the sculpt is incredibly detailed. 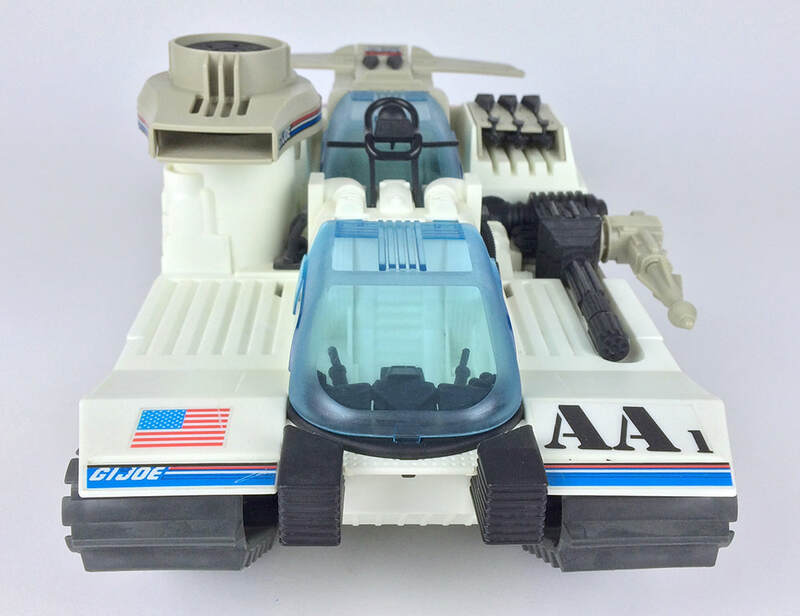 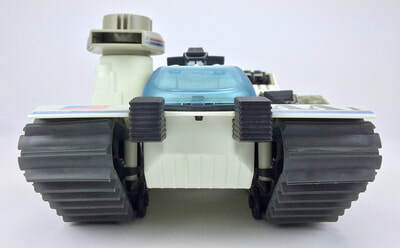 The front of the vehicle does not feature much detailing, but it does have two ribbed black bumper tips protruding from the cockpit. 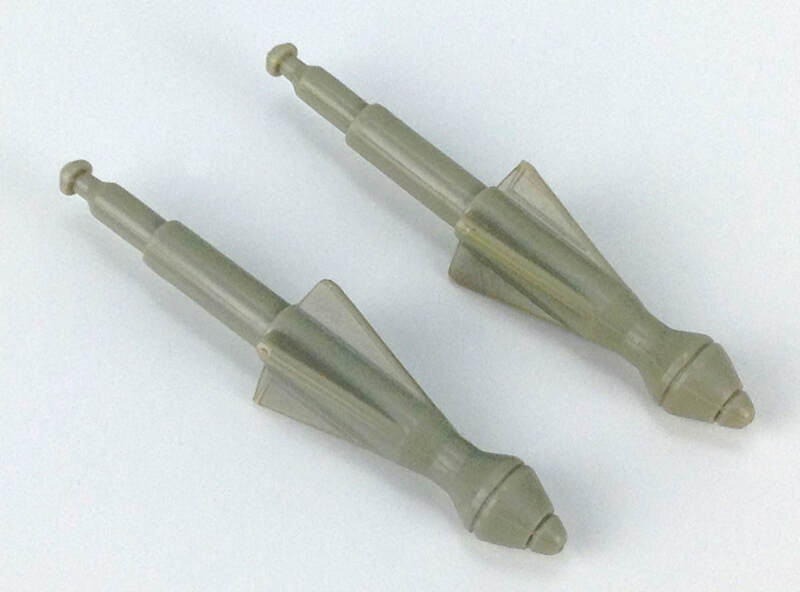 These are likely the front end telecommunications VHF/UHF antennae pointed out on the blueprints. The anti-piercing armor track treads feature wheels with incredible sculpted detail. 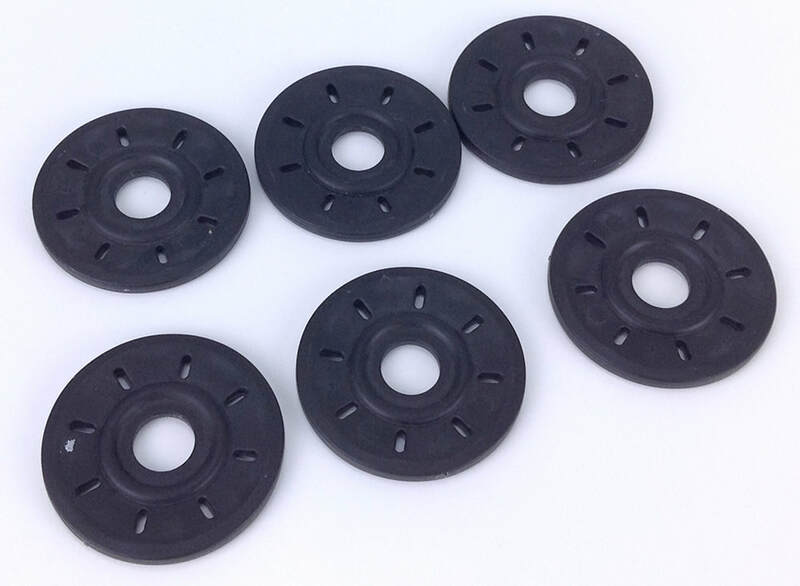 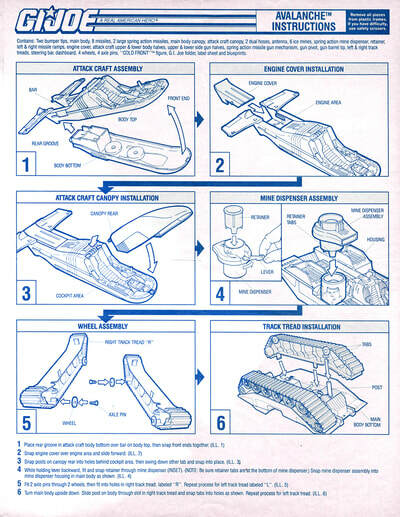 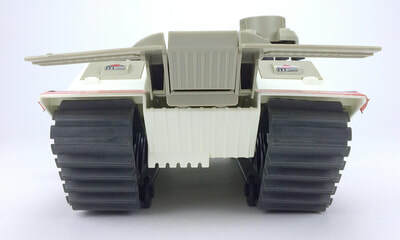 The wheels are molded into the treads and do not move. 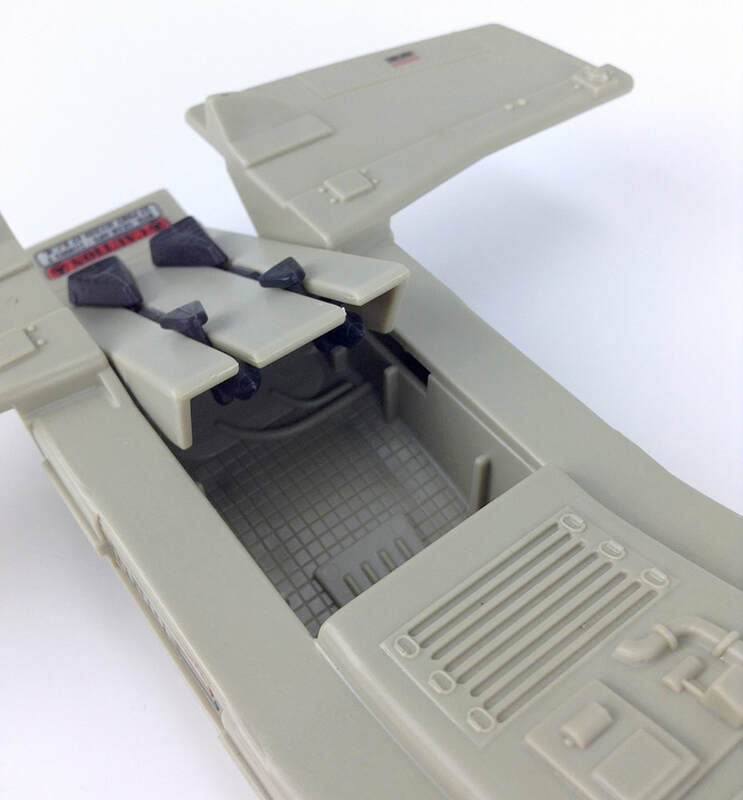 Forward pilot's cockpit features a shock-proof canopy, which elevates at the rear connection point. The cockpit area consists of the molded details of the main body and the separate steering bar. 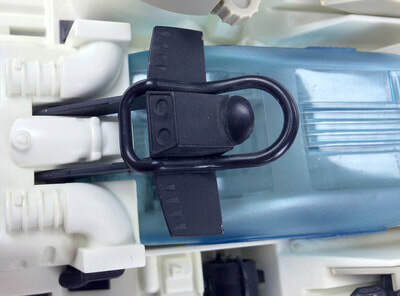 The main steering bar pieces elevates to allow the figure to be placed into the cockpit. 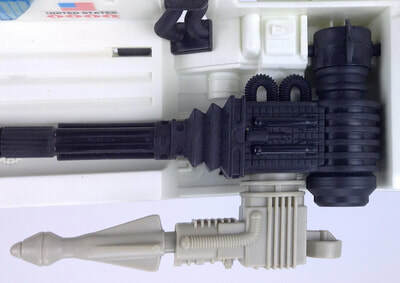 The side swipe, missile firing pulse cannon launcher is directly attached to the full-swing, ammo regenerating freeze blast cannon. 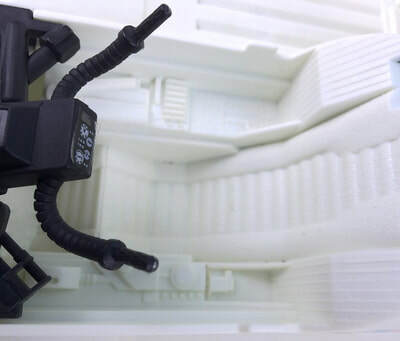 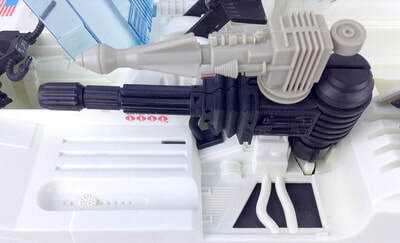 The pulse cannon can swivel 360 degrees at the connection point. 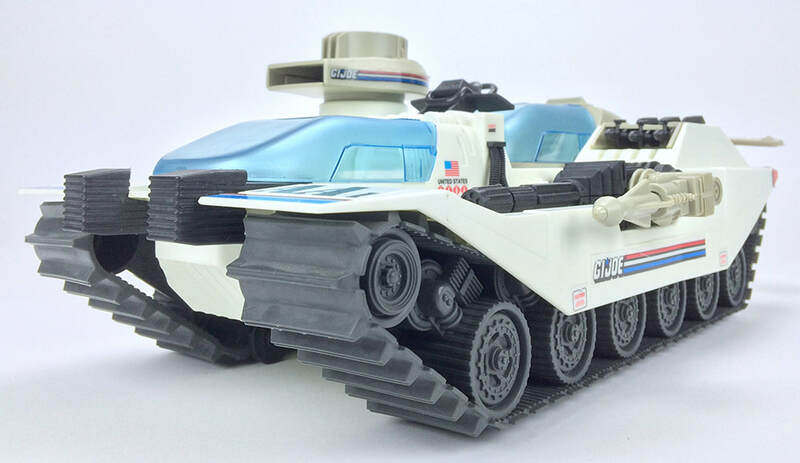 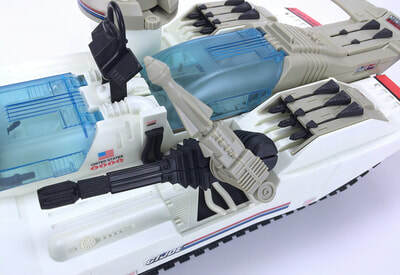 By default, the freeze blast cannon lies at rest on the vehicle chassis. 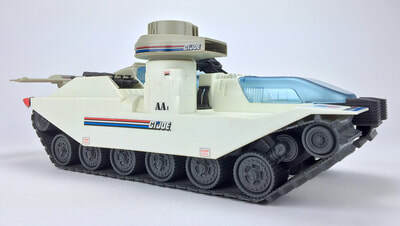 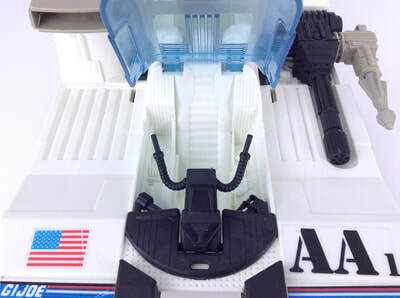 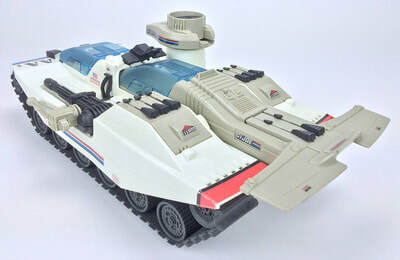 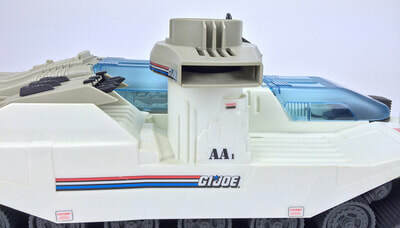 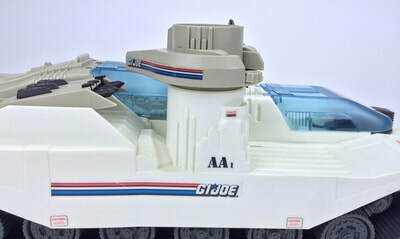 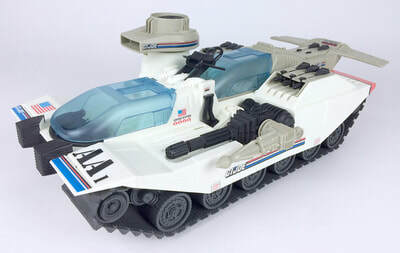 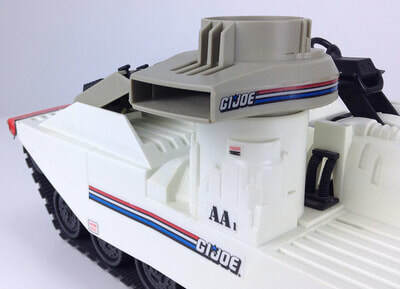 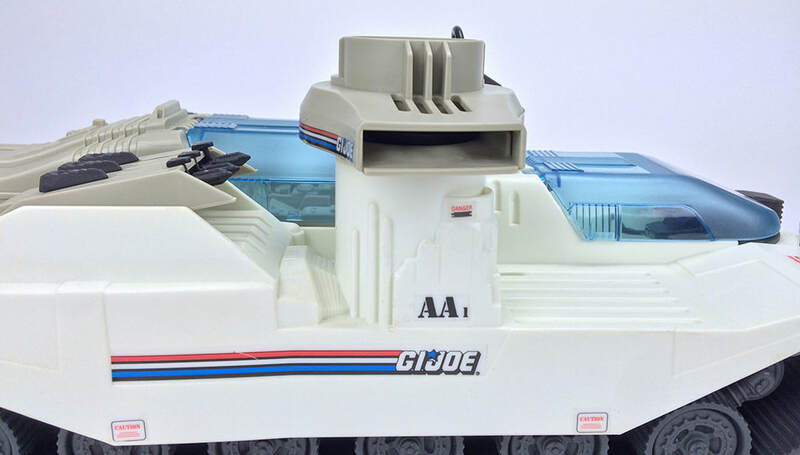 The freeze blast cannon can also be positioned so that it is elevated 90 degrees at the connection point to the chassis. 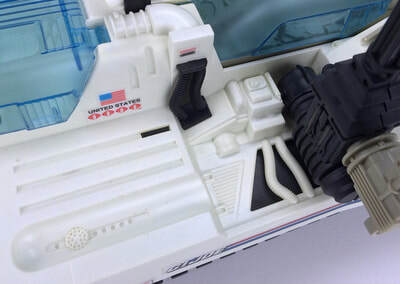 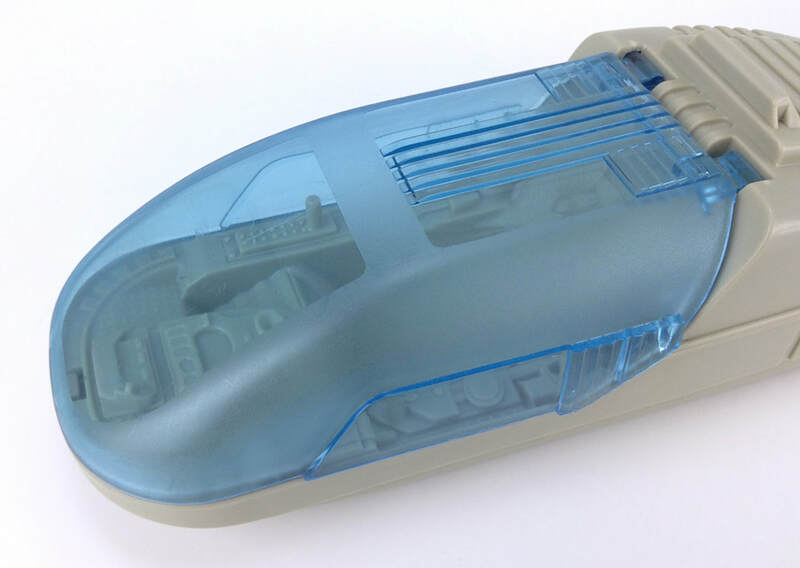 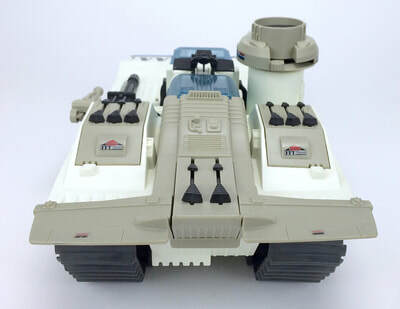 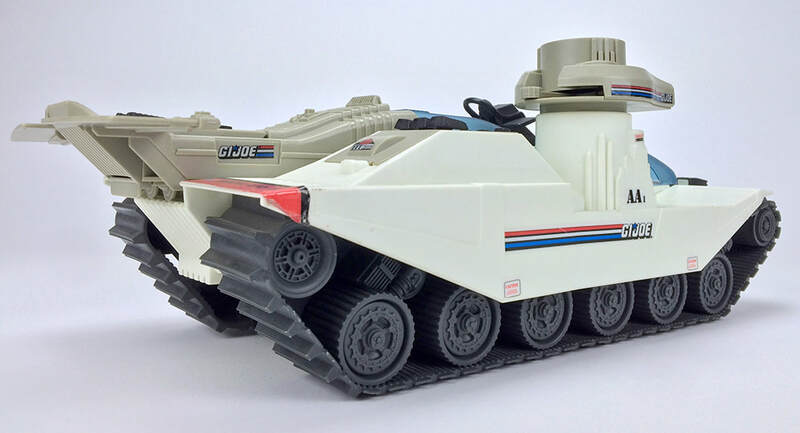 The chassis contains a slot for resting the freeze blast cannon's barrel. 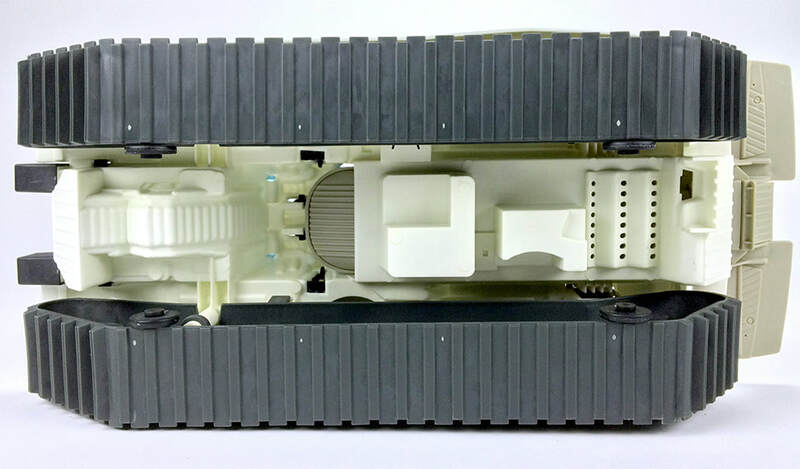 The digitally accurate ice mine deployer holds six launch-able ice mines. The spring action rapid fire mine dispenser swivels 360 degrees. 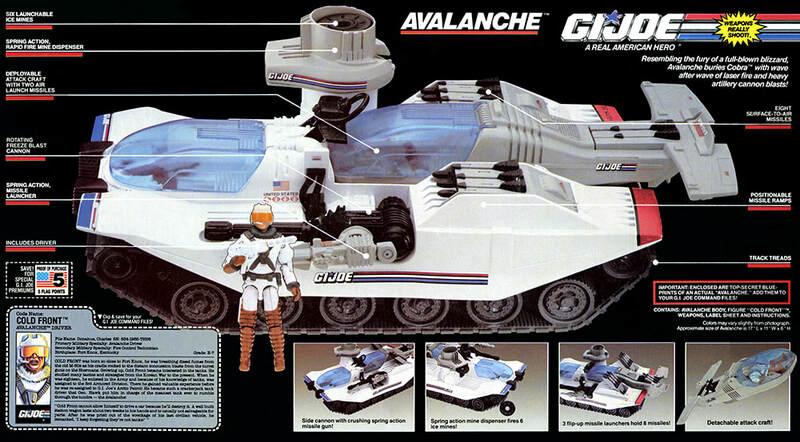 Six launchable ice mines are included. The synchronized, computer enhanced, pinpoint trajectory, missile launch bases house eight heat-seeking, high impact surface to air missiles. 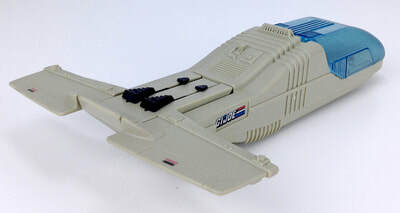 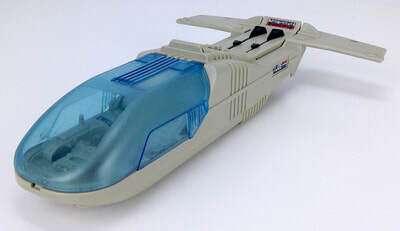 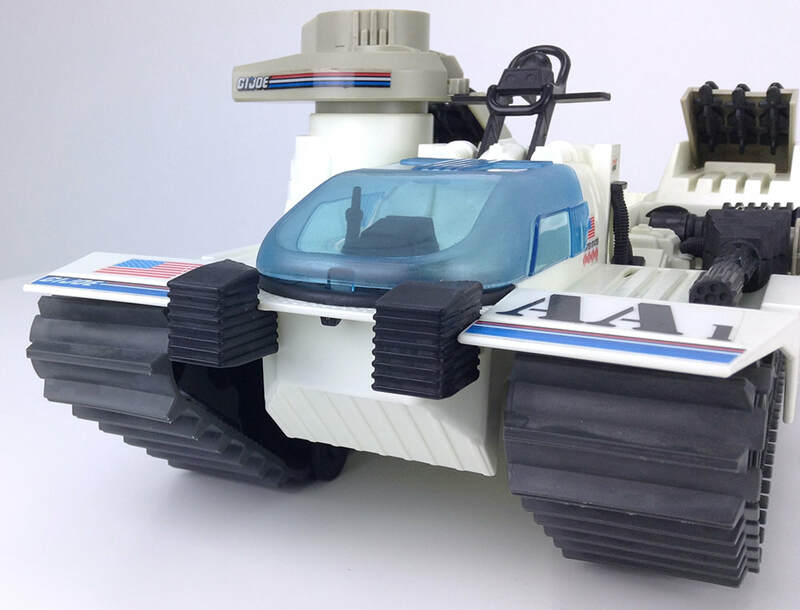 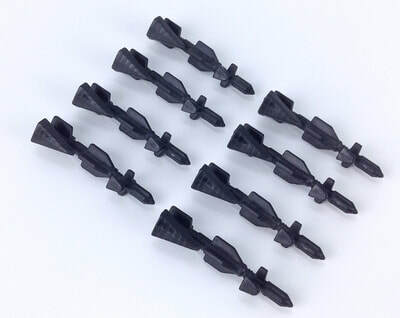 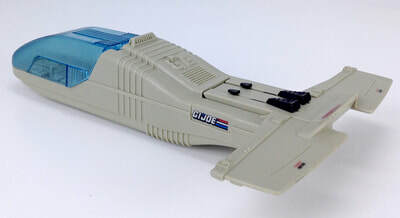 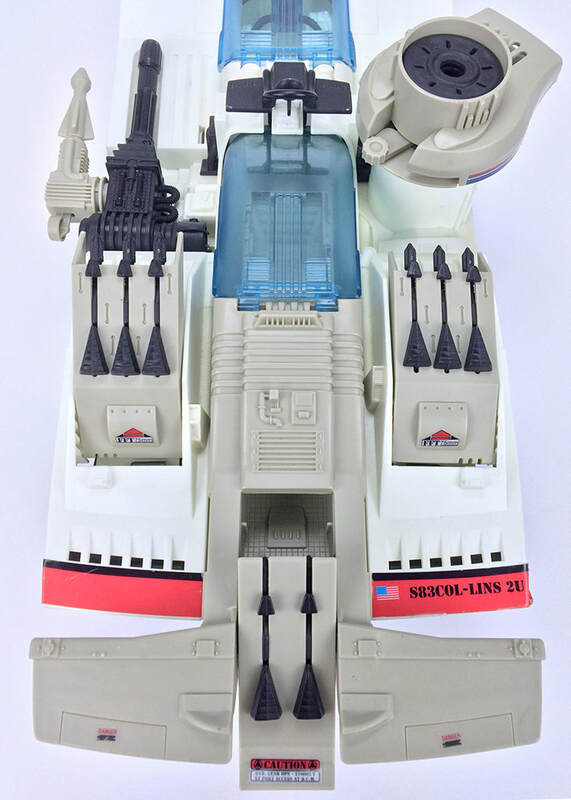 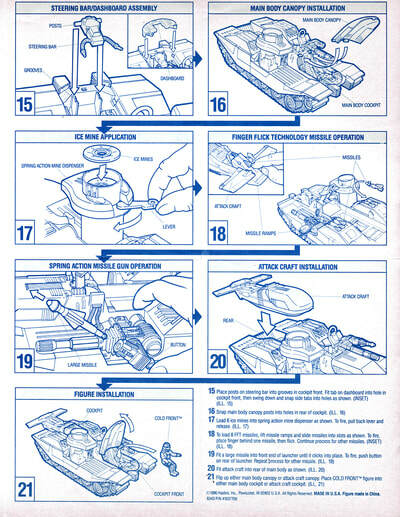 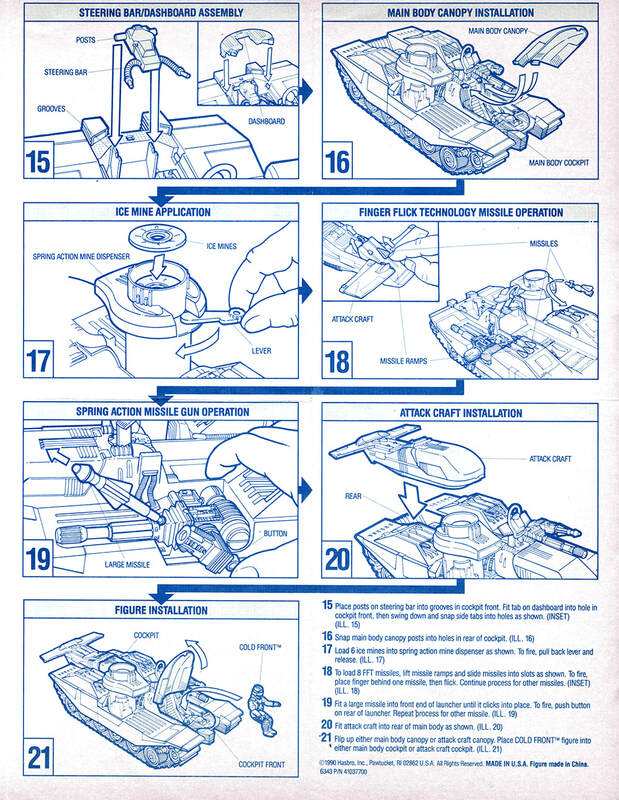 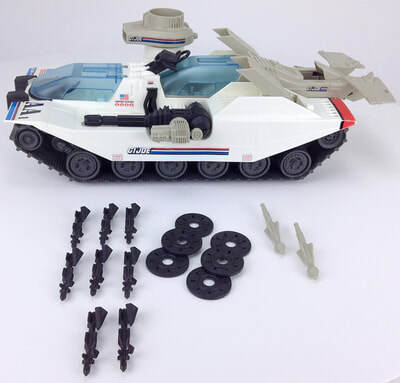 Hasbro utilized "Finger Flick Technology" (FFT) to enable kids to fire these missiles by flicking the tips that sit on top of the missile racks. 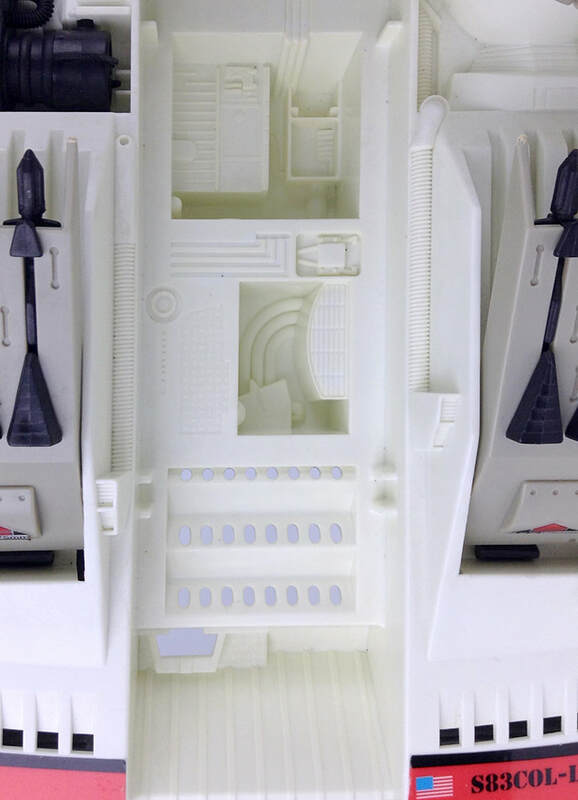 Behind the missile launch bases are dual engine systems access panels for on-site speed adjustments. 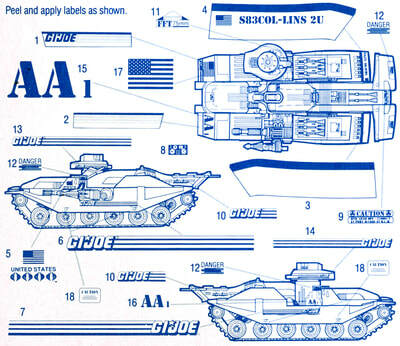 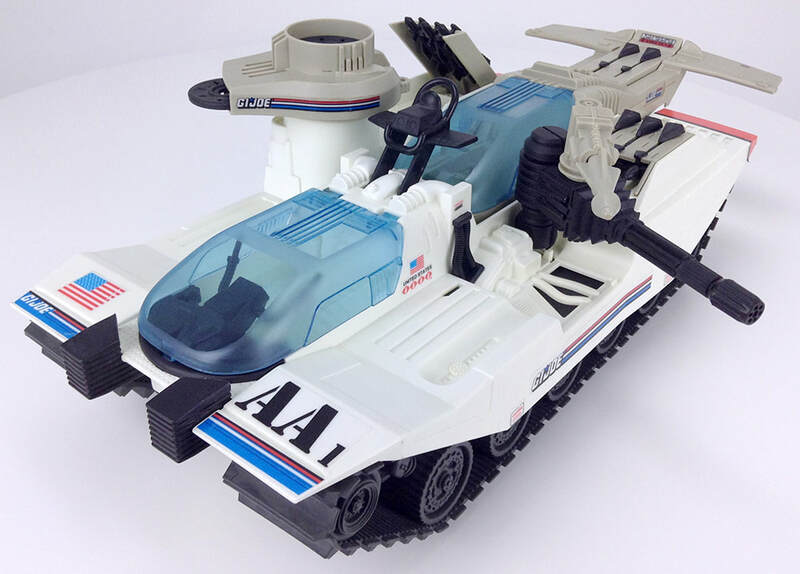 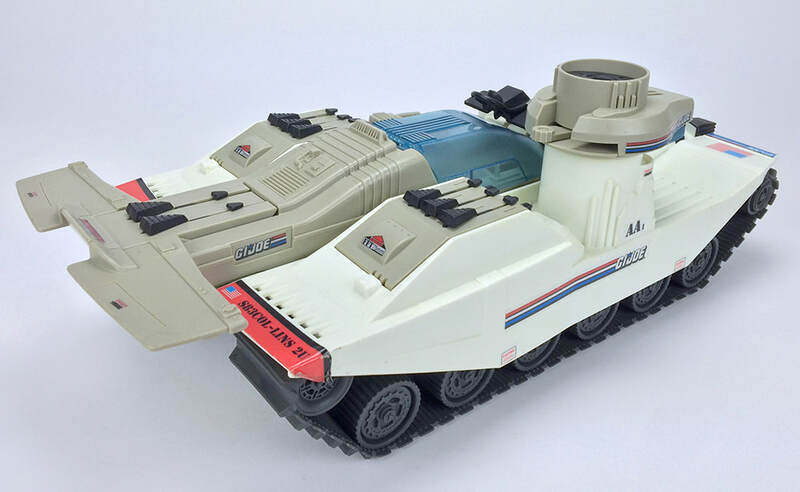 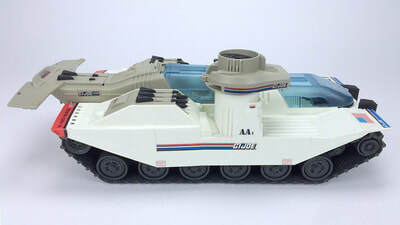 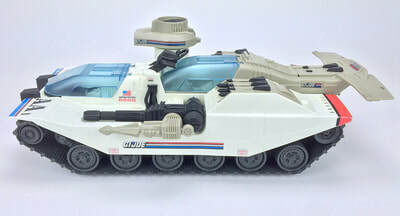 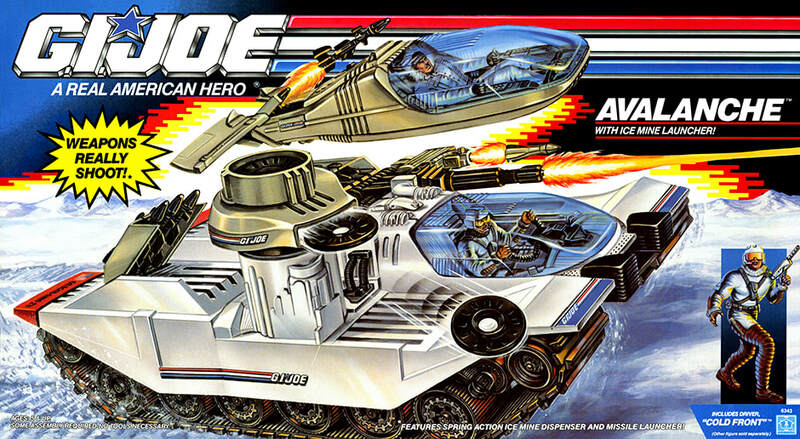 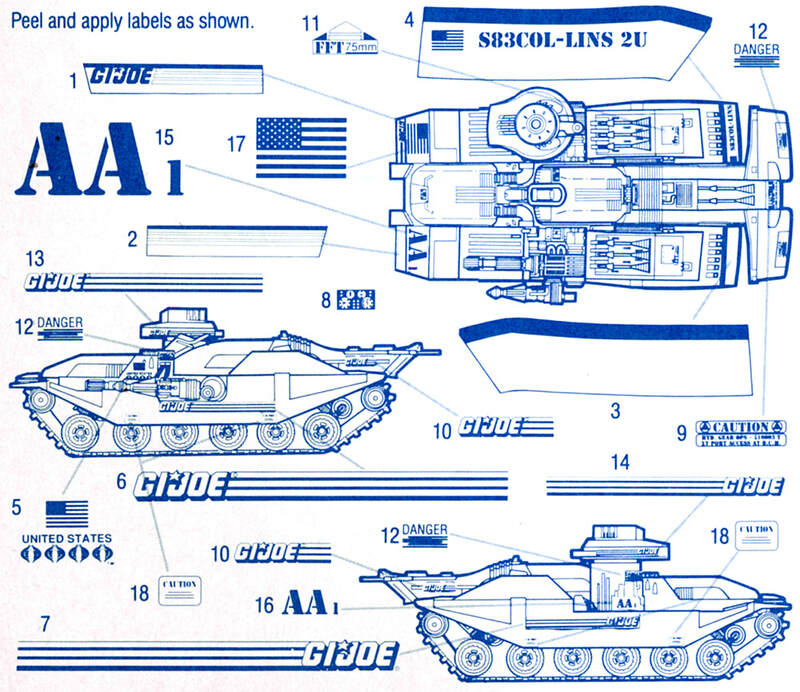 Eight heat-seeking, high impact surface to air missiles are included. 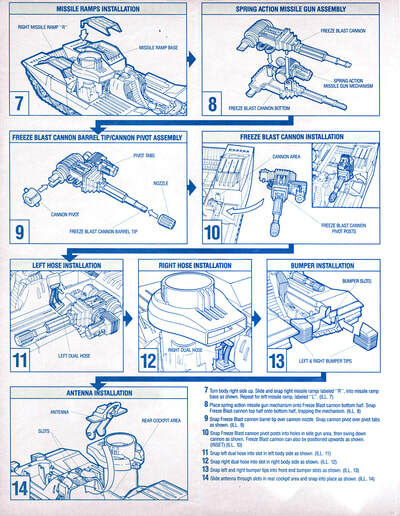 The rear cockpit, copter/tank separation system control lifts to enable deployment of the attack craft. 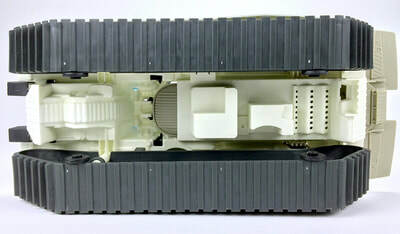 The deployable attack craft is armed with two air launch missiles. 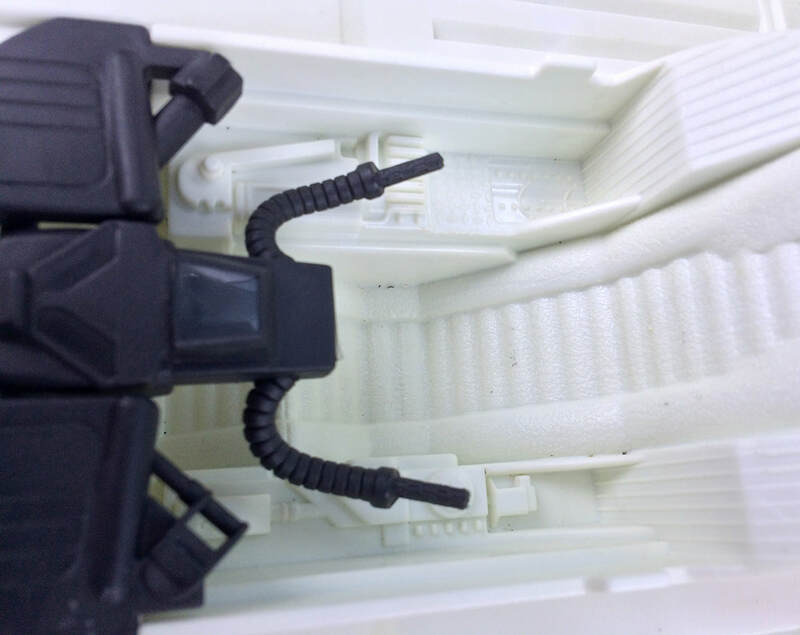 Behind the canopy sits an anti-emssions, copter engine coolant convertor. The rear wing features mach-speed, smooth braking activation panels. 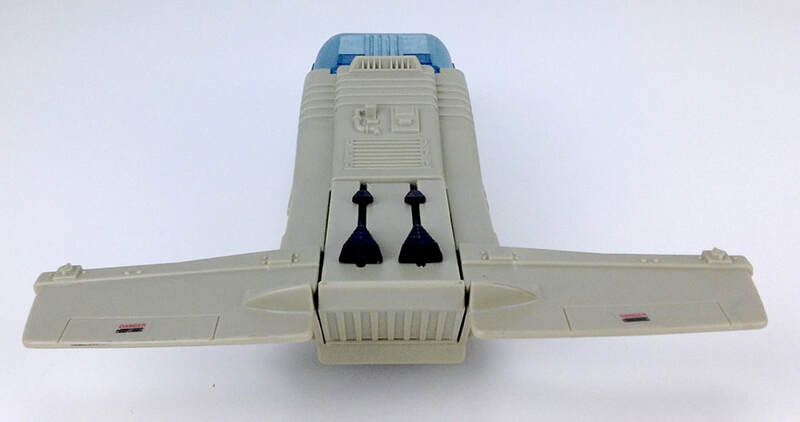 The rear wing also houses an in-flight, laser light verification system. 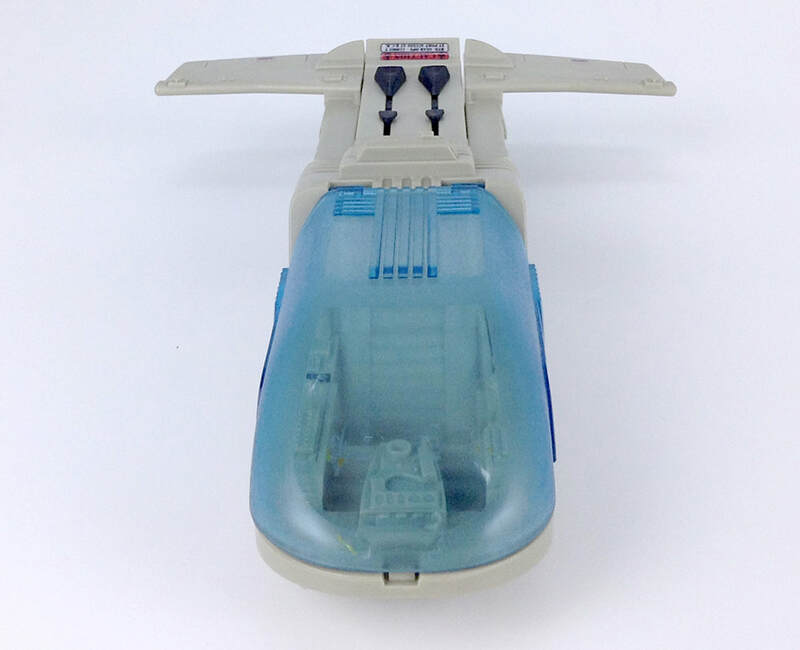 The rear pilot's cockpit features a shock-proof canopy, which elevates at the rear connection point. 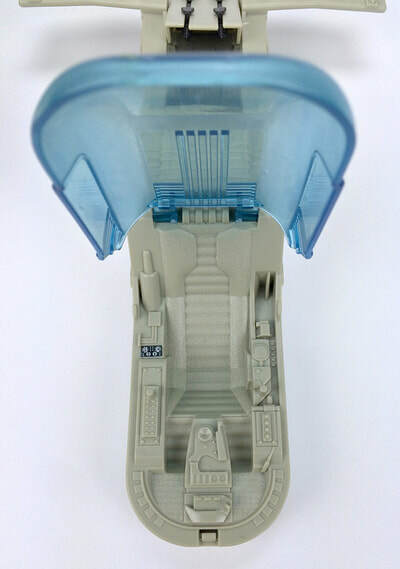 The rear pilot's cockpit is incredibly detailed. 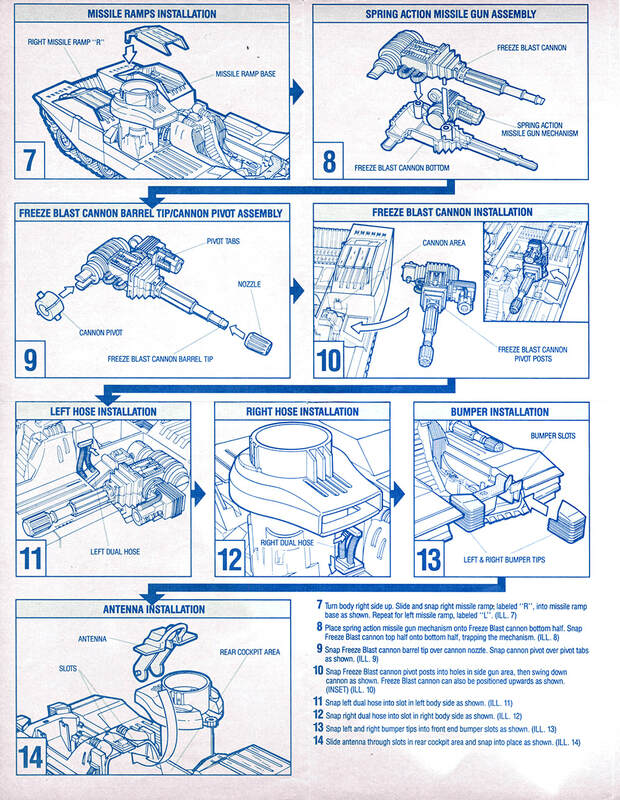 The blueprint calls out backblast, defense, dual pulsating 55mm canons. However, these appear to be the same heat-seeking, high impact surface to air missiles. 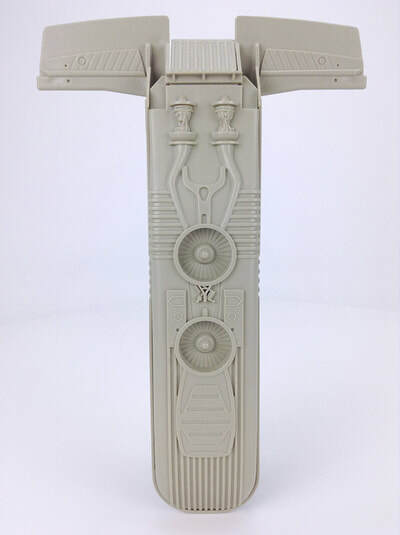 Nice molding details underneath the deployable craft reveal liftoff fans and rear thrusters. The landing bay is nicely detailed. 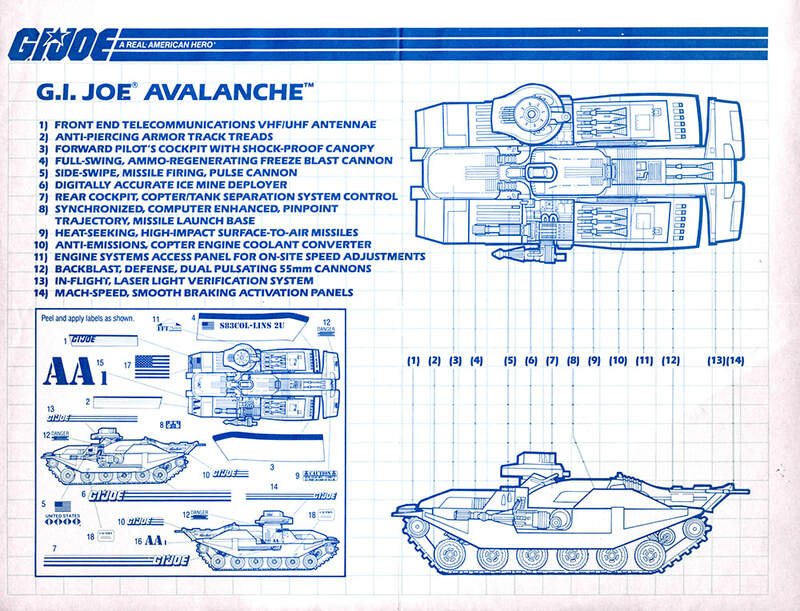 Unfortunately, the Avalanche suffers from a hollow underbody. 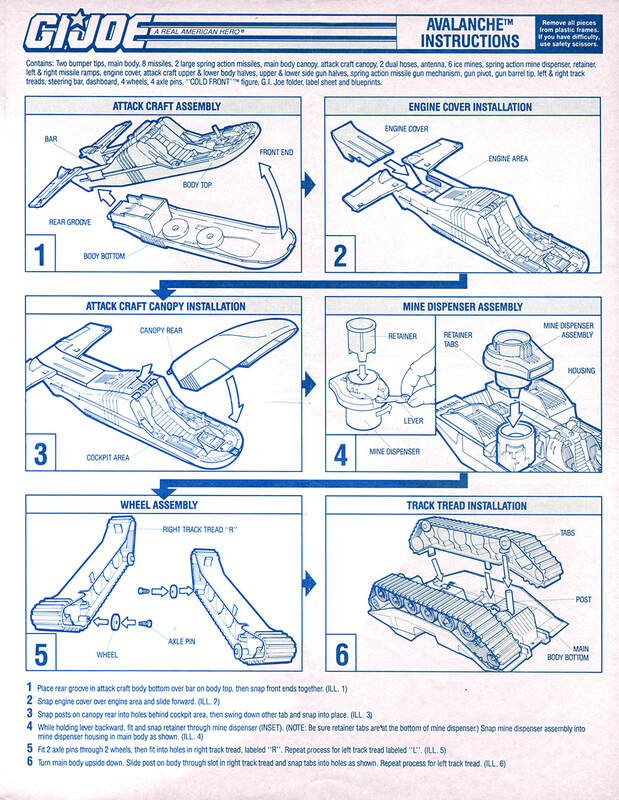 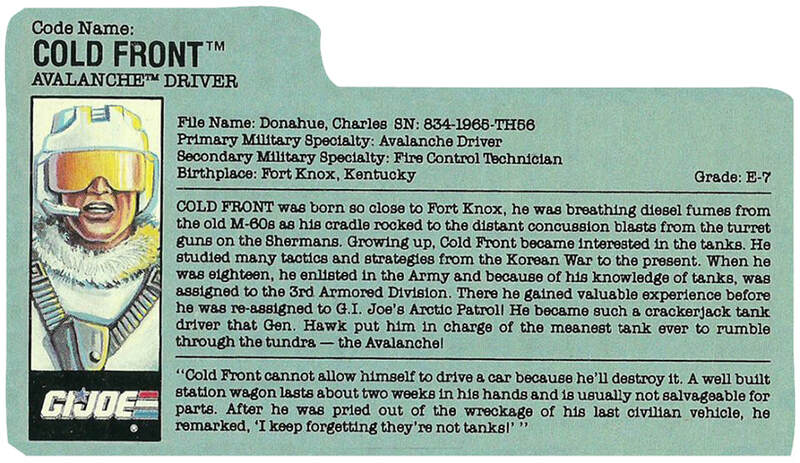 This was a cost saving technique used widely in the 90s. 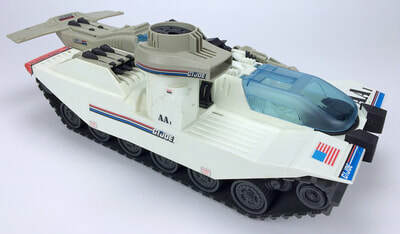 The Avalanche is ready for battle! 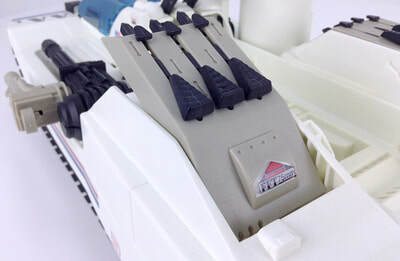 This image shows the eight "Finger Flick Technology" (FFT) missiles, the six ice mines, and the two spring fired missiles included with the Avalanche. 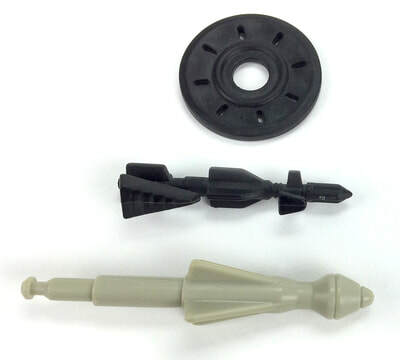 This image shows a close up size comparison of the FFT missile, an ice mine, and a spring fired missile.